I’ve missed you! Every time I try to bake you something wonderful, or even sit down with a few Fall photos to say hello, something else calls for my attention. But a girl has to eat lunch, right? This gives me the perfect opportunity to sit and relax for a few minutes and give you an update on our upcoming life change. In 11 days the movers will arrive to pack all of our breakables and load the semi truck. I opted to pack all of the non-breakables because it just kills me to give away money for something I can easily (?) do myself. The packing will begin this weekend. My husband is in New Hampshire for the third weekend in a row to look at houses. Let me just say that there are an abundance of homes for sale in NH. There’s also an abundance of blue counter tops, purple carpet, wallpaper, and houses that more than likely have ghosts (which I don’t believe in…but why chance it, right?). People also have so much stuff. I mean so much stuff that it’s hard to see past all of it and envision what the house would look like if you lived in it. Another interesting thing about NH is that unless you live in Manchester, pretty much the entire state is rural. This means that almost every single house is on at least an acre of land. And hundreds of houses on the market are on 3+ acres. Plus going all the way up to 27! At first we thought we wanted a lot of acreage. I had dreams of huge organic gardens, chickens, maybe a goat for fresh goat’s milk cheese, a barn to lay in the hay and contemplate life…. Then, reality struck. We are used to having dinner parties and family over to the house regularly where we live now, but when we move, it will just be the two of us, two dogs, and a cat. We talked about it and decided that we thought it would be a better idea to downsize. Why have all that to take care of when we would rather spend our weekends and our $$$ traveling around the east and seeing what there is to see? Enter an issue…it’s actually HARD to find a small house in NH. Every house Tony is looking at today has at least 1 acre. And they all have more square footage than we have now. Hmmm…well, if we don’t want a haunted, dusty, wallpapered, purple carpet, blue counter top kind of house, then we’re just going to have to go with it. On the plus side, we’ll have plenty of room for visitors. So although there are a lot of houses on the market back there, there are not an abundance of houses that we would like to live in or take on as a project. I have searched through at least 900 homes on the internet. Yes, you read that right. Out of those 900 homes, I believe after this weekend Tony will have looked at less than 20 in person. So that gives you an idea of what’s out there. We have a decent price range too. But I keep telling my husband, “Gee honey, if we could just pop it up a notch (several) to a million, we’d have a lot more to choose from.” Ha! Needless to say, that got a good laugh. If we can find one this weekend and our offer is accepted, then depending on the weather, we will either head to NH or North Carolina to wait it out until it closes. If we don’t find a house, then really, our only option is to try to rent something, somewhere in NH, on a month to month basis until we can find something that is a good fit for us. I’ve been trying to keep up on all of your blogs every few days! If I haven’t left a little note, please don’t think I’m not looking. I love to see what’s happening with all of you. Things will be getting more hectic, but I’ll try my hardest keep up on all of the exciting things that you guys are all doing too! This is incredibly easy. 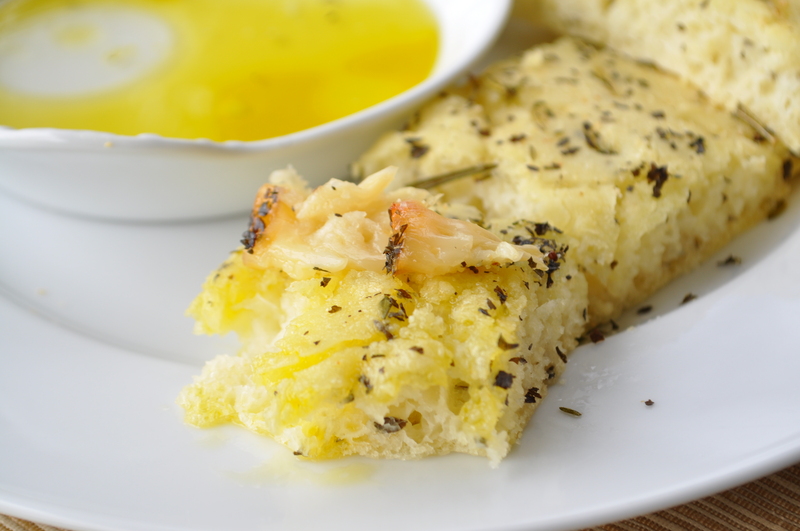 In an hour tops you can have freshly baked focaccia bread dipped or spread with whatever you like. 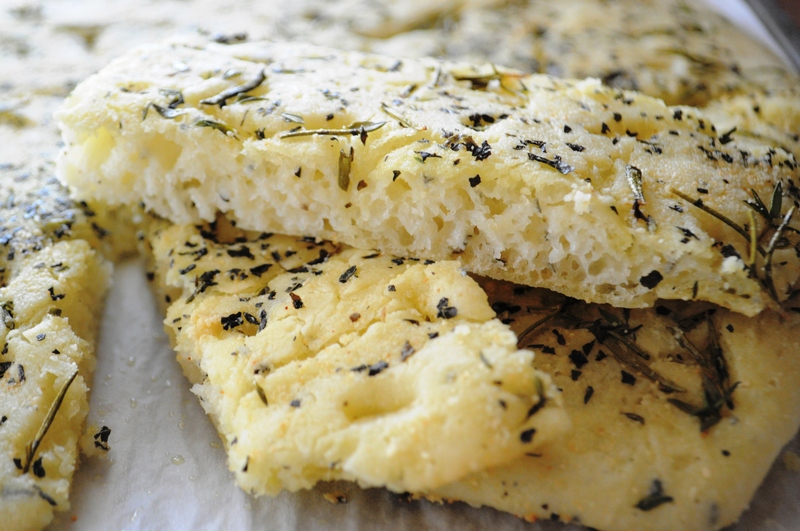 I used a half portion of my favorite gluten-free french bread mix (add any type of herbs, garlic, seasonings that you like in the bread dough). It was left over from pizza the other night. I used half for the pizza crust and then just sprayed a ziplock with olive oil and stored the remaining dough in the fridge. First, take a whole head of garlic and slice off the top. 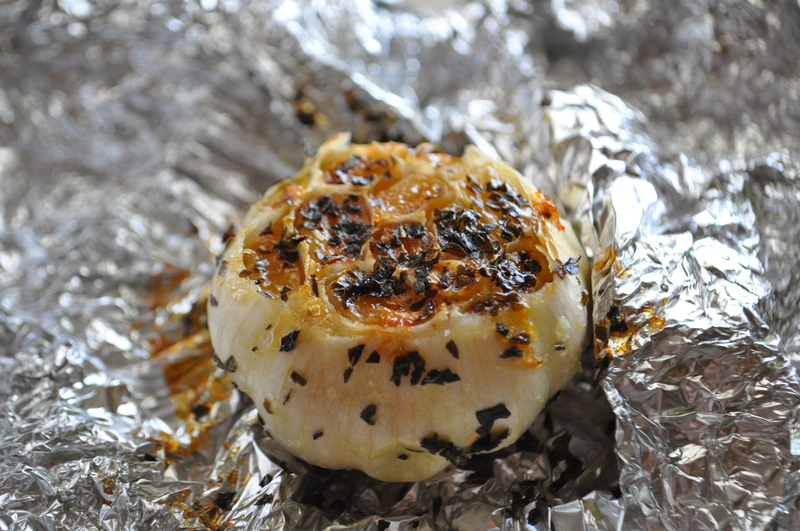 Set it on a piece of tin foil and drizzle with olive oil and herbs. 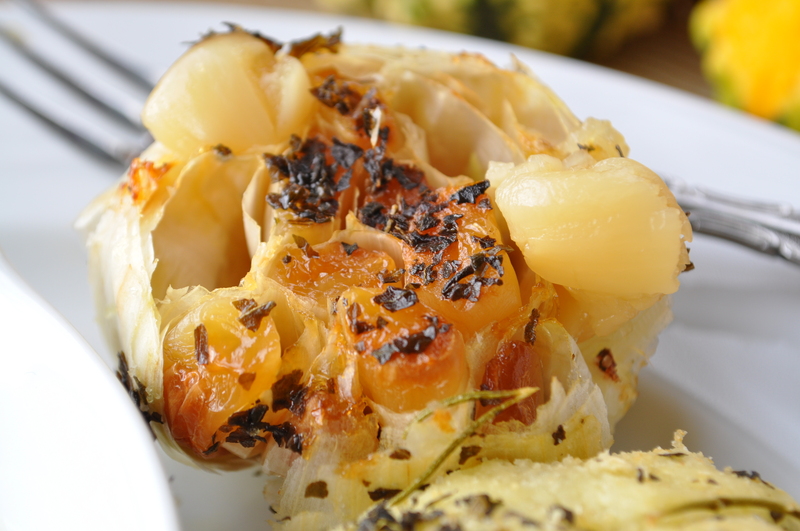 Close up the tinfoil and bake in a small dish (the olive oil will leak) for about 45 minutes at 350 degrees. While the garlic is baking, get the dough ready. It will be really sticky when you take it out, so you’ll want to have gluten-free flour handy. I covered a small baking sheet with parchment, patted out the dough with floured hands, and lightly poked holes all over it with my fingers. 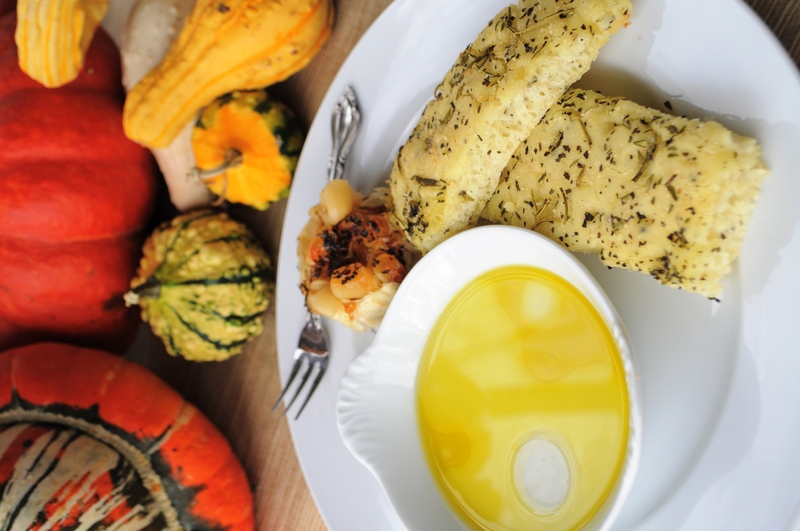 Then, drizzled it generously with olive oil, sprinkled with kosher salt, garlic powder, and herbs. I used basil, thyme, and rosemary, because that’s what I had on hand. I also sprinkled it generously with dairy free Parmesan. Cover it loosely with plastic wrap and place on top of your stove to rise. When the garlic is done, remove the plastic from the dough and bake for about 35 minutes or so, but don’t over bake it! You want it to feel “springy” when you touch the middle. Slice and enjoy however you like. 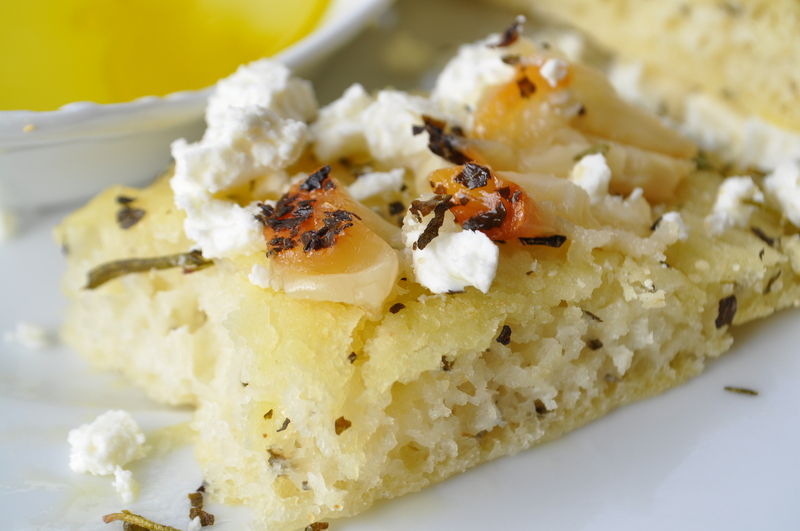 I dipped mine in good olive oil, white balsamic vinegar, spread the roasted garlic on top, and sprinkled it with crumbled goat cheese. And yes, I ate the entire head of garlic in one sitting, by myself. Oh, April, this is so exciting yet so daunting a task! I’m sure you’ll find just the perfect house for your little family. One acre is surely just right? Then you can have a small garden, 2 chickens.. and a gathering of the WordPress Clan for a picnic on the lawn, lol! Good luck and don’t worry about getting round to all of us.. we’re just happy for you! I would love a picnic with my WordPress friends! How fun would that be?! Oh my goodness! How do kids afford to move out on their own? I suppose there are always apartments that they can share with friends. We are extra lucky this time around because the terrible US housing market is working in our favor in NH. Our house here sold for $35,000 less than it would have 4 years ago, but we are making that up purchasing a house on the east coast because their real estate market is also having issues. However, on Thursday we had 8 houses on a list for Tony to see on Friday and by Friday morning 4 of them had been sold. So it’s definitely picking up and people are taking advantage of the “buyers market”. 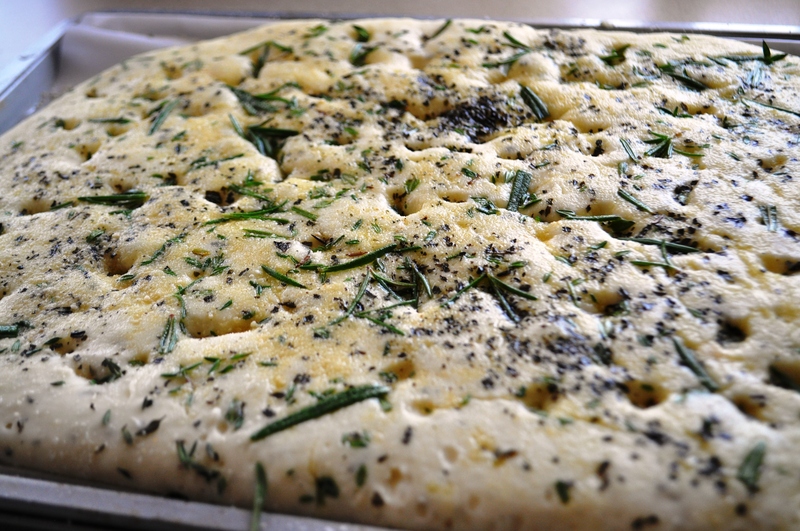 I made focaccia at school last week, and yours looks every bit as delectable! When my first child left home, it was very traumatic. By the time the 4th one left, and we had recycled back a couple of the flown flock, it turned more into thoughts like….I miss my solitude. You will discover a new you. I love what I found in the empty nest……I actually found ME…..not a mother…not a wife….not a coworker…just me. Took awhile to figure it out, but I’m loving life as an empty nester!